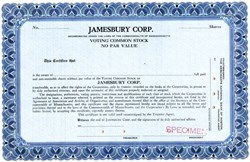 Beautifully engraved specimen certificate from the Jamesbury Corp. This historic document was printed by the John A. Lowell Banknote Company and has an ornate border around it. Jamesbury products include, flanged ball valves, Value-Line® threaded ball valves, emission control valves, high-performance butterfly valves, special service valves, and ball and butterfly valve actuators and accessories. Jamesbury branded products are known for their long history of innovation and proven reliability. Industry breakthroughs include the flexible-lip, polymeric, and Xtreme® seating technologies which have dramatically extended the cycle life and the application range of our ball and butterfly valves. Choose Jamesbury when dependability is your key selection criteria.